I am a well-established, award-winning artist. My work has been exhibited around the world. I live near Thaxted in North West Essex but also spend a lot of time near Stiffkey on the North Norfolk coast of England. These areas are the main inspiration for my quilts. My work is mainly landscape. I love walking and taking photographs which I use to inspire my work, hoping that the feel of the areas will come across in my quilts. My current work is inspired by the landscape of East Anglia – the broad view and the intimate detail of real and sometimes imagined landscapes. In looking and contemplation, the imagery used in the work is varied and highly personal, reflecting the landscape, and hoping to engage viewers with a sense of time and place. 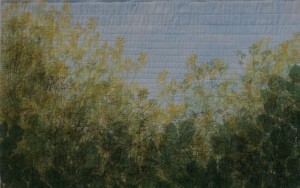 Having made pieced quilts for many years, I am now concentrating on whole cloth quilts. I put colour on to cotton and linen cloth with thickened Procion dye, in a variety of ways. I quilt by hand and machine. USA 2016/17 Quilt in SAQA Made in Europe I toured USA for 1 year. This entry was posted in Uncategorized on November 11, 2017 by Admin.